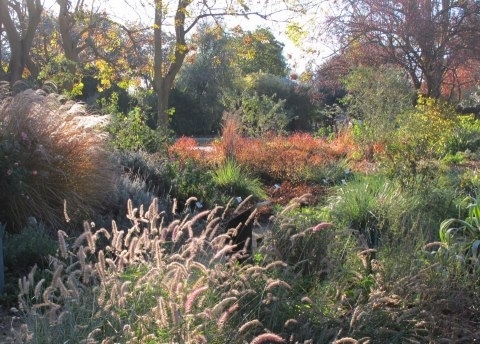 December is a challenging month for gardening. Apart from the cold weather, the winter solstice is approaching, and that means less sunshine to power the engine of photosynthesis in plants. Oncewinter rains begin, the wet soil becomes fragile and should not be walked on nor dug too vigorously. Chilly nights challenge our citrus trees, succulents and other frost-tenderlandscape plants. On top of the seissues, holiday commitments take up a lot of the time that one might otherwise spend in the garden. So what should a gardener be doing this month?Some tasks are priorities, so let's tackle those first. If you have citrus trees or other tender plants, you must mitigate their exposure to frost or they will suffer. Already I have recorded night-time temperatures below 30°F at my home. I have five citrus trees in four locations, so I use a combination of strategies. For the two trees close enough to the house to reach with an outdoor extension cord, I have strung Christmas lights (not LED type) in the branches. I plug in the lights on cold nights. Another tree, a dwarf citrus, is short enough that an old patio umbrella clears its branches. I toss an old comforter over the umbrella ribs when frost threatens. For the other two citrus, I set up ladders to support tarps and old blankets. Once the temperature begins to rise in the morning, I remove all the coverings and unplug the lights. Unless we get an arctic blast, all of these trees should survive the winter. Water is also a priority. Until rains thoroughly wet the soil, I pay attention to my rain gauge. If we have less than an inch of rain in a two-week period, I figure that any actively growing plants will need irrigation. In my garden, that's mostly vegetables. My fall-planted greens are producing lots of leaves for stir-fry and salad, and November garlic is beginning to emerge. Citrus trees will also need some water, especially if the weather is cold. During the summer I used gray water from my laundry to water my roses; now that those plants are going dormant, I'm using the gray water for citrus trees. I have switched to a plant-friendly laundry detergent and have not noticed any negative effect on the plants irrigated with gray water. But note that I only use gray water on trees and shrubs; the vegetables get potable water. Already we have had enough rain in Napa Valley to start greening our hillsides. But the same rains have prompted weeds to emerge in my garden beds. While these weeds are small, they are easy to pull or hoe. Weeds take just as much water as edibles, so removing them now will conserve water for the plants I want. As you weed, note areas of bare soil. If possible, cover bare spots with mulch or compost, or plant a cover crop if you can keep it moist. Winter is hard on soil. Rain compacts it; wind and sun dry it out. Soil is the foundation for all of your plants so protect it. Earthworms, fungi and other soil microorganisms will reward you with healthier soil next spring when it's time to plant. Last but not least, finish your fall cleanup. Remove spent vegetable plants. Put diseased plant material in your yard-waste bin rather than in your compost pile. 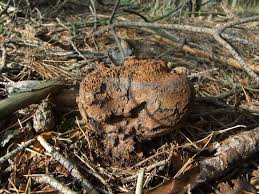 Most backyard compost piles do not get hot enough to destroy pathogens. In contrast, the waste-management companies compost at high temperatures that do control bacterial and fungal diseases. Rake up leaves and other litter to eliminate hiding places for snails, slugs and harmful insects. 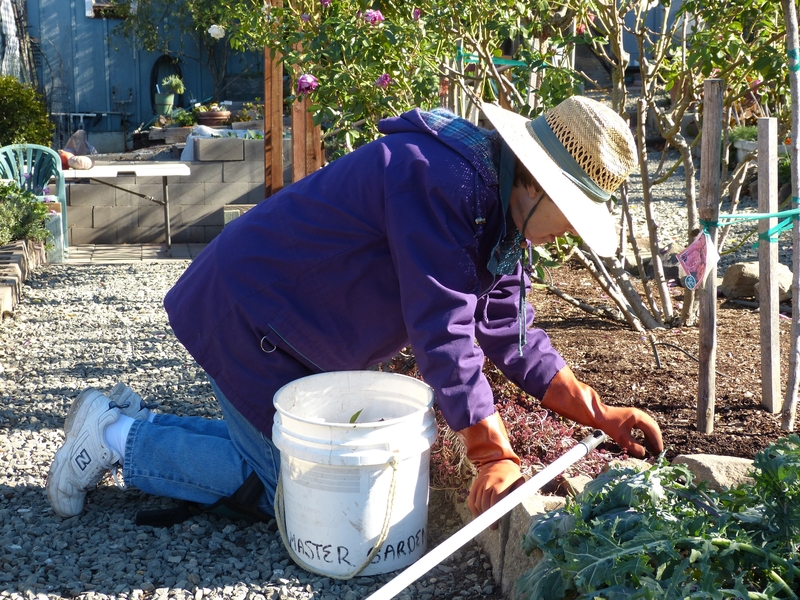 In next week's column, we'll look at December gardening activities that are less like maintenance and more like fun. Although I have to admit, on sunny winter days I am perfectly happy to be outside even if all I do is pull weeds. It makes a nice break from working on the computer or in the house. 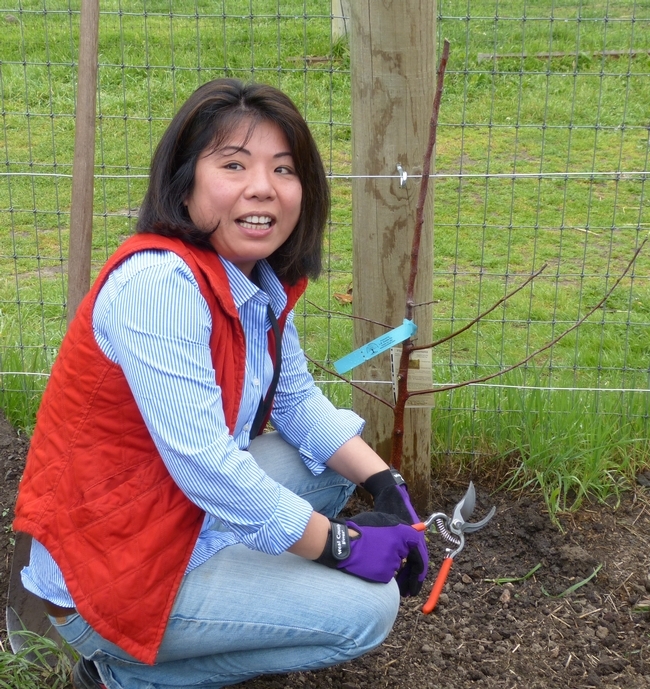 Workshop: U. C. Master Gardeners of Napa County will host a workshop on “Rose Pruning and Maintenance” on Saturday, January 9, from 10 a.m. to noon, at the University of California Cooperative Extension office, 1710 Soscol Avenue, Napa. 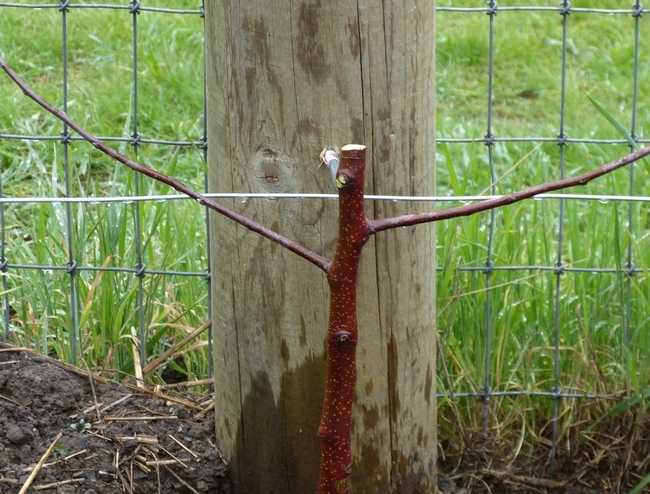 This workshop will feature demonstrations of proper pruning techniques. Master Gardeners will discuss types of roses, common rose diseases and routine maintenance. On-line registration (credit card only);Mail-in registration (check only). 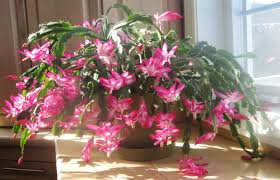 One of my favorite houseplants at this time of year is holiday cactus. During November and December, these cacti are covered with long tubular blooms. Over the years, I have collected several plants, each with different colored blossoms, including white, pale pink, hot pink, red and salmon. While I used to think that all of these plants were Christmas cacti, I recently learned that two types of holiday cacti bloom during November and December. The one that most stores sell is Schlumbergera truncate, the so-called Thanksgiving cactus that blooms around that holiday. The second type is Schlumbergerabridgesii, which blooms about one month later. That one is the true Christmas cactus. The Thanksgiving cactus has flattened stem segments with saw tooth projections along the margins; the Christmas cactus has more rounded margins. In addition, the anthers of the Thanksgiving cactus are yellow, while the anthers on the Christmas cactus are purplish-brown. These cacti are native to South America, growing in tropical jungles at altitudes ranging from 3,000 to 5,000 feet. They are epiphytes, meaning that they grow on objects or other plants. They obtain water and nutrients from the humid air around them instead of from the soil. When grown indoors, these cacti need bright but filtered light, so place them near a south-facing window. In warmer months, they can live outside in a sheltered shady place. While these plants are easy to grow, it is sometimes a challenge to get them to bloom for the holidays. There are a few tricks to encouraging bloom. Pinch back the stems in early June to encourage branching and more terminals for flowers. At the end of September, remove any end segments that are either damaged or less than a half-inch long. Flower buds will only form on undamaged, mature stem segments. Holiday cacti set their flower buds when the days turn shorter and cooler. To create optimum blooming conditions, provide cool nighttime temperatures (50°F to 55°F) and 12 to 14 hours of darkness starting in mid-September. Street lights, car lights or indoor lighting can disrupt the required dark period, so place cacti where constant darkness is guaranteed. Reduce watering as growth slows. When flower buds appear, gradually increase watering and provide temperatures between 60°F and 65°F. Feed every other week during the bloom period with a fertilizer intended for houseplants. While the plants are blooming, keep them away from drafty spots and heating or air conditioning vents. After blooming, the plants appreciate a rest period of six to eight weeks. Keep them cool (around 55°F) and water lightly until new spring growth appears. During the growing season,feed monthly with houseplant fertilizer diluted to half strength. Stop fertilizing in late summer to encourage fall flowering. Holiday cacti like to be pot bound. Repot them about every three years in the spring. Choose a fast-draining mix containing 60 to 80 percent potting soil and 20 to 40 percent perlite. Allow the soil mixture to dry out partially before watering so air can circulate around the roots. Propagate the cacti by taking cuttings in May or June. Select stems with three to five segments. Let cuttings dry in the shade for at least one day. Fill a clean four- to six-inch container with fresh potting soil. Insert three to five cuttings one inch deep into moistened soil. Cover the plants and container with a clear plastic bag or other translucent material to create a mini greenhouse. Support the plastic so that it does not touch the cuttings. A clean, clear plastic soda bottle with the bottom removed works great as a covering. Place the covered container in bright, indirect light. In three to eight weeks, roots will form and you can remove the covering. If your cactus isn't blooming by Christmas, all is not lost. Give it the daily darkness treatment for six to eight weeks, and you should have a flowering plant by early spring. Workshop: U. C. Master Gardeners of Napa County will host a workshop on “Rose Pruning and Maintenance” on Saturday, January 9, from 10 a.m. to noon, at the University of California Cooperative Extension office, 1710 Soscol Avenue, Napa.This workshop will feature demonstrations of proper pruning techniques. Master Gardeners will discuss types of roses, common rose diseases and routine maintenance On-line registration (credit card only) coming soon. Mail-in registration (check only).